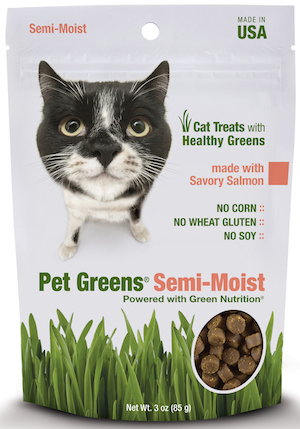 Cat Grass In A Tasty Treat!All Natural :: Great Taste :: Healthy GreensSatisfy your kitty’s craving for greens with Pet Greens® Semi-Moist Cat Treats! Every mouth-watering morsel contains real meat as the first ingredient, plus added fish oil provides nourishing Omega-3 fatty acids for skin and coat health. Tasty, bite-sized pieces contain healthy wheat grass, a nutrient-rich source of essential vitamins, minerals, antioxidants and fiber for improved digestion. 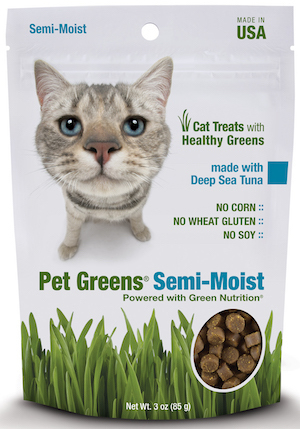 Available in 7 yummy recipes, these treats provide a healthy snack in a soft, moist texture that cats love. 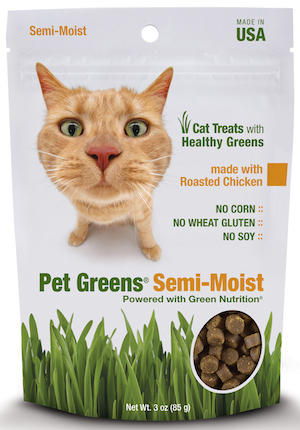 :: Pet Greens Treats can satisfy your cat’s natural instinct to eat potentially harmful houseplants or chemically-treated outdoor grass. 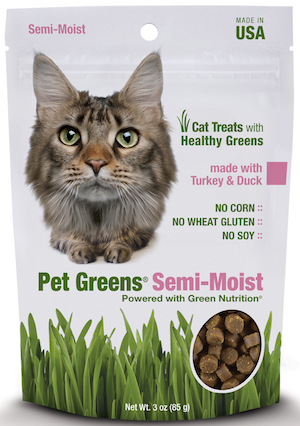 :: Treats contain NO artificial colors or flavors, NO wheat gluten, corn, or soy and may be ideal for cats with sensitive stomachs. Chicken, Rice Flour, Barley Flour, Vegetable Glycerin, Maple Syrup, Whole Ground Potatoes, Ground Wheat Grass Powder, Tuna, Brewer’s Dried Yeast, Phosphoric Acid, Dried Cheddar Cheese, Tapioca Starch, Natural Flavor, Salt, Fish Oil (preserved with Mixed Tocopherols)*, Dried Egg Product, preserved with Sorbic Acid and Mixed Tocopherols. Tuna, Rice Flour, Chicken, Barley Flour, Vegetable Glycerin, Maple Syrup, Whole Ground Potatoes, Ground Wheat Grass Powder, Brewer’s Dried Yeast, Phosphoric Acid, Dried Cheddar Cheese, Tapioca Starch, Natural Flavor, Salt, Fish Oil (preserved with Mixed Tocopherols)*, Dried Egg Product, preserved with Sorbic Acid and Mixed Tocopherols. Salmon, Rice Flour, Barley Flour, Vegetable Glycerin, Maple Syrup, Chicken, Whole Ground Potatoes, Ground Wheat Grass Powder, Brewer’s Dried Yeast, Phosphoric Acid, Dried Cheddar Cheese, Tapioca Starch, Natural Flavor, Salt, Fish Oil (preserved with Mixed Tocopherols)*,Dried Egg Product, preserved with Sorbic Acid and Mixed Tocopherols. Turkey, Rice Flour, Barley Flour, Vegetable Glycerin, Maple Syrup, Duck, Chicken, Whole Ground Potatoes, Ground Wheat Grass Powder, Brewer’s Dried Yeast, Phosphoric Acid, Dried Cheddar Cheese, Tapioca Starch, Natural Flavor, Salt, Fish Oil (preserved with Mixed Tocopherols), Dried Egg Product, preserved with Sorbic Acid and Mixed Tocopherols.